It uses up anything I have in my fridge. Provided I have eggs, of course. Any excuse for more butternut squash is a good one. Minimal cleanup. If you cook your veggies in advance, you only need to worry about the pan. And plates, if you’re that kind of family. It doubles as breakfast. Or lunch. Or snack. Whatever. No fussy crust to deal with. Which means gluten free, which means I won’t kill my friends if they come over for a nosh. Also, it’s got a funny name. You can’t really go wrong with foods that have funny names, right? Preheat oven to 400°F. Toss squash in olive oil, salt, and pepper, and spread onto a rimmed baking sheet. (Note: You can use the same skillet you plan on cooking the frittata in, if you like.) Roast about 25 minutes or until squash is tender and lightly browned, stirring halfway through cooking time. Remove from oven and set aside, and preheat oven to broil. Whisk together eggs, milk, and herbes de Provence. Heat a cast-iron or other oven-safe skillet over medium-high heat, and add the butter. Swirl the pan to coat it as the butter melts. Once the butter has melted, add the butternut squash to the skillet, then pour in the egg mixture. Cook on the stove approximately 5 minutes or just until starting to set on top. 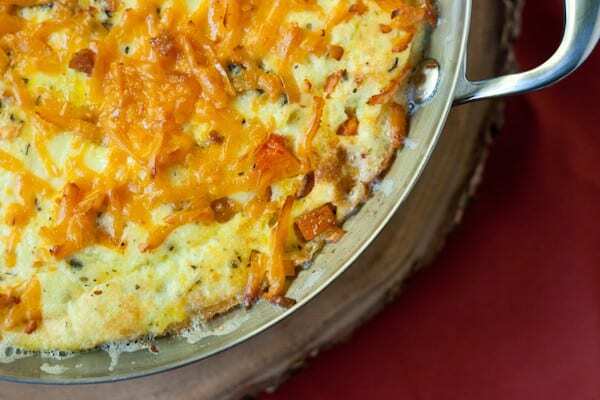 Scatter cheese over the top and move skillet to the oven. Cook for approximately 5 more minutes, until cheese is melted and top is set and lightly browned. This sounds like an almost perfect food, and once you add the cheese, it’s is perfect. I’m really looking forward to trying this one!! You missed another reason to love frittata: It’s fun to say!! 🙂 This looks delicious! I absolutely LOVE frittatas. This will definitely be made at my home soon. Thank you! This looks SO good! Definitely making this!